Not from what the golfers I know tell me. They say his swing is just terrible. and his politics is even worse.. But what is he putting? Er. sorry, I thought it was puttering…. New WH shoes on the furniture photo with Lincoln looking over his shoulder. You are absolutely correct. No coincidence at all. From what I’ve read about Arab culture, it is a sign of disrespect to show the sole of one’s shoes to another. The person exposing their soles consider onlookers to be beneath them. The scowl on his face only adds to message. That was certainly true of this photo. 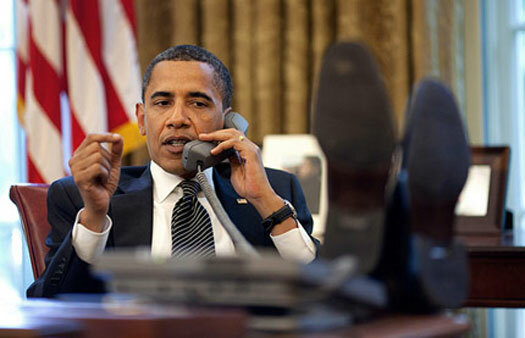 He was on the phone with Netanyahu with holes, yet, in the soles of his shoes. That photo was shown throughout the ME. Abe looks pissed… As he should. Can’t this narcissistic bonehead show a little decorum? Both in his daily actions and his overall demeanor? That is not your furniture, you grinning, smarmy, freeloading bag of feces, it is an Historical Artifact, and belongs to the people of the United States. Get your Goddamn feet off my furniture, get to work, and start achieving what the PEOPLE want, not what your twisted idea of the future should be. We know what Obama is thing but what the hell is the Pete Souza, the photogrpher, thinking? He also worked for Reagan. I didn’t know that he worked for Reagan. Doesn’t say too much for Pete Souza that he would take this kind of photo. Especially if he suggested the pose. Morals and ethics are in very short supply in D.C.
Looks bored out of his gourd? Needa finda*#@#& way ta fix doz polls mo betta , an rayz mo $$$..
Im too @#%# smart and importint ta be sittin wit deez dweedz.. So @#$%$# hard bein da smartist one in da White cribhouse..
#@$% !! left ma carpet putter in da uddaroom.. Golf? who said golf? ” oh #%@& ! !, false alarm, day sed gulf ! Is it lunch yet? batroom break? @#%# too much lobster last nite agin..
Dont I looks cool wit ma feet up? ta make on ma impotant blackberry an send Joe in ma place…te he ! They’re weaning BO off the telly but his delivery is sooo slow and deliberate and boring. It’s better than Ambien. He looks down every other word. It’s embarassing. He can’t remember one whole sentence without looking at his notes. He’s obviously too busy to study ahead of time. Why should he? He knows more than any of his advisors. Where’s the snooze button? Only got through the first two minutes and it was painful.